What a beautiful fall color picture! 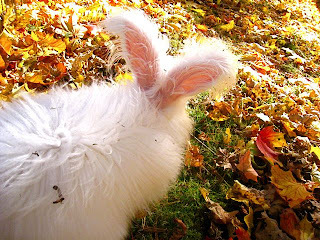 I did not know that the special quality of Fall light was produced directly from Nuage's ears. We all thank him for this valuable service. What nice fall colors! Can I come join in? Um, Nuage, you know you're not supposed to wear white after Labor Day, right (not that we care, ibunoclasts are what we like best)??? I wish I was romping in the fall leaves - we don't have them here. beautiful. wish i was there to play in the leaves too.